Within the pages of a book exists a world drawn from a writer’s deepest imaginings, one that has the ability to pull readers in on a visceral level—but only if the realm and its inhabitants can be described well. This can be achieved by providing readers with a unique sensory experience via the setting. So much more than stage dressing, the setting can build mood, convey m Within the pages of a book exists a world drawn from a writer’s deepest imaginings, one that has the ability to pull readers in on a visceral level—but only if the realm and its inhabitants can be described well. This can be achieved by providing readers with a unique sensory experience via the setting. So much more than stage dressing, the setting can build mood, convey meaning through symbolism, drive the plot by creating challenges that force the hero to fight for what he wants, and trigger emotions which will reveal his most intimate feelings, fears, and desires. To ask other readers questions about The Rural Setting Thesaurus, please sign up. The tumbled walls of the ancient ruins stretched upwards, basking in the sun’s glow. Indeed, they were warm to the touch, their stone surfaces worn and smooth from centuries of wind and rain. Overgrown grass hugged the stones’ knees while snapdragons and cornflowers nodded in the gentle breeze. The book is set up simply. Pick any rural setting (for urban settings, there’s a thesaurus on those too!!) such as: Block Party. You’re given suggestions based on sights, sounds, tastes, smells, textures and sensations, possible conflicts that could happen here, people that can be found here, related settings that might tie in, setting notes and tips, and examples of how this setting can work in your story. So, if I wanted to have a story set during a house fire, I could pick from sights: smoke drifting at the ceiling level and sliding under the doors, and from tastes ( a hard one to come up with sometimes): thick phlegm, and from notes and tips: that smoke inhalations makes memory recall and problem solving more difficult. Or one set in nursery, I could pick from sounds: the baby sucking on thumb or slurping at fingers, and from smells, disinfectant, and discover the type of people found here are babysitters for one. The rural settings go from everything in an attic to county fairs to a bonus material: ancient ruins. There’s SO much that could be of use to a writer here. I know when I’m researching places, it’s sometimes difficult to find information on each of these choices. This book solves that problem. I hope it will do the same for you. The Rural Setting Thesaurus is a great tool for all writers. no matter what genre you write the settings are as important as the characters and plot. I didn't realize just how much until I read this book. I learned so much and will be using this book in the future for all my writing. There are so many examples and tips before you get to the actual Thesaurus part broken down into many settings. The table of contents is linked so you can click it and go right to the pages you need. It is so easy t The Rural Setting Thesaurus is a great tool for all writers. no matter what genre you write the settings are as important as the characters and plot. I didn't realize just how much until I read this book. I learned so much and will be using this book in the future for all my writing. There are so many examples and tips before you get to the actual Thesaurus part broken down into many settings. The table of contents is linked so you can click it and go right to the pages you need. It is so easy to use, interesting to read and easy to follow. I loved the Emotion Thesaurus books and I will love these just as much. If you write these are tools you need in your library I also can't wait to check out the Urban Thesaurus as well. I was so happy when I finished reading this master piece for its what I have been searching for. It has everything I need to set up a scene and to do what I need when the words are sounding the same. The Rural Setting Thesaurus opens with some great suggestions on how to use setting to make your story come alive and then an entries for various settings and what they might be like. They include the sounds, smells, tastes, sensations and possible sources of conflict that might come from that setting amongst other suggestions. Again, an invaluable resource. I have the whole set on my kindle which I can carry with me for easy reference. On the Kindle version the table of contents is linked and y The Rural Setting Thesaurus opens with some great suggestions on how to use setting to make your story come alive and then an entries for various settings and what they might be like. They include the sounds, smells, tastes, sensations and possible sources of conflict that might come from that setting amongst other suggestions. Again, an invaluable resource. I will say that I do struggle with this particular one in the series because I don't like how the information is formatted. It's not as easy to scan through for I love this series of books. They're great desk references for authors wanting inspiration for their writing. It helps spur new ideas and helps your writing from becoming stagnant and repetitive (just like having a regular thesaurus does for your word choice). I would highly recommend these books for anyone looking to improve their craft. This Thesaurus was lacking compared to many of the others in the series. You could feel a specific bias behind some of the entries. Sure, it's not meant to be in-depth but I think they could have done better with more experience along socio-economic paths. Maybe take in more peer reviews and take from different genres to fill in more of a vision. A must-have for any writer or author! 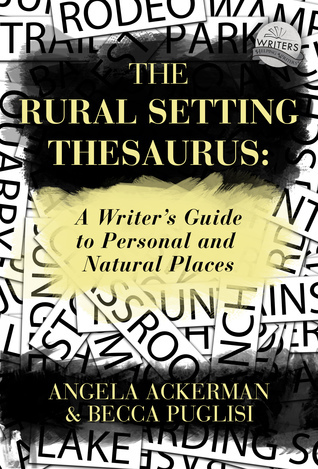 Ackerman and Publisi not only provide a comprehensive list of rural setting descriptions, but they start the thesaurus out with great examples and advice on how to get the most out of your setting descriptions with the use of similes, metaphors, personification, hyperboles, and more. Truly grateful for these books. I like this book. Not only excellent suggestions for specific descriptions, but good tips on using the senses in descriptions and good explanations about what makes a description good. Just got it. Looks good! I ordered several of the other books in this series. By including sections on the senses: sights, sounds, smells, it gives me a lot more material to use in writing descriptive prose. A great book for describing rural settings. They've thought of everything when putting this book together. This is now one of my standard resource books. A great tool for every writer. Even if you don't actively need to fill in a setting, I find thumbing through it gives me inspiration for being more intentional with setting my stories. This is a must read, and then re-read, series. A vital reference for writers. Great descriptive resource for writers. I have found it very useful in my own writing. Less settings than the Urban Thesaurus, but still a great resource. I wish it was more inclusive and beyond USA. Not helpful for stories which aren't in USA at all. I was hoping for more variation with landscapes, timelines, vegetation. A pretty good book, that has helped me with my book writing. Loved this book. Helped me explore new ways of experiencing a scene and writing out. A great reference book for writing. What I love about these books is that they can help spark your imagination in your first draft, but they're also invaluable to the editing process. I was lucky enough to win this book through Goodreads Giveaways (which is AMAZING because this is only the second time I've ever (memorably) won anything in my 3 decades on this earth). But I was planning on buying it if hadn't won it. I own Becca Puglisi's and Angela Ackerman's other thesauruses and love them. I was so excited when they announced they were going to release this book and its companion, The Urban Setting Thesaurus. I knew I would not be disappointed, but this book is even better I was lucky enough to win this book through Goodreads Giveaways (which is AMAZING because this is only the second time I've ever (memorably) won anything in my 3 decades on this earth). But I was planning on buying it if hadn't won it. I own Becca Puglisi's and Angela Ackerman's other thesauruses and love them. I was so excited when they announced they were going to release this book and its companion, The Urban Setting Thesaurus. I knew I would not be disappointed, but this book is even better than I expected. Setting is not something I'm great at writing, but it's something that really resonates with me when I read, so I've been loving using this book to learn how to write it better myself! Prefacing the setting entries are several articles on how to write your settings to accomplish different goals, such as how to use it to create mood, what kinds of conflict a character could experience due to the setting, etc. The information here is great and well explained. I always enjoy the way they explain techniques, because they make it so easy to follow. The entries themselves are broken up into different categories: At Home, At School, Rural Sights, and Nature & Landforms. Each entry features lists of the sights, sounds, tastes, and textures/sensations one might experience in that setting. I love this! Being able to have these lists in front of me as I write will remind me to include those necessary senses to ground my readers. And obviously, the lists are not exhaustive, but have helped to prompt me to think of other possibilities that might be typical (or interestingly atypical) for that location. Each entry also features possible sources of conflict, the people you can commonly find in that setting, a list of related settings, setting notes and tips, and an example of a description of that setting. I love these too--especially the possible sources of conflict and the people commonly found in that setting--because these lists help me brainstorm the things that my characters could get into while in particular settings. The book also features two appendixes: Setting Exercises and the Setting Planner Tool. The Setting Exercises appendix is particularly great, because you can use it to practice writing setting by giving some prompts and having you list the senses you experience. Setting is something I'm not particularly great at writing, so I will definitely be using this appendix to practice and get better at it. I probably wouldn't use the Setting Planner Tool unless I was stuck, but only because I don't like to plan things out in such detail--at least with the first draft. I can definitely see it helping me in rewrites, though! Overall, this book is an indispensable resource and something I know I will come back to over and over again as I write. I was already planning to also pick up the Urban Setting Thesaurus, but after seeing this book in person and going through it, I know I absolutely NEED it! A disclamer: I got a copy of this e-book to write an honest review. What a brilliant resource! I am a huge setting "avoider". Or at least I used to be. And I was afraid of describing the settings thinking that these descriptions took away from the story I was writing. I did manage in the past to improve the settings' descriptions during the self-edit and later work with a professional editor, but it was often with inner struggle. Now this has changed. There are so many wonderful ideas in this the A disclamer: I got a copy of this e-book to write an honest review. What a brilliant resource! I am a huge setting "avoider". Or at least I used to be. And I was afraid of describing the settings thinking that these descriptions took away from the story I was writing. I did manage in the past to improve the settings' descriptions during the self-edit and later work with a professional editor, but it was often with inner struggle. Now this has changed. There are so many wonderful ideas in this thesaurus, and I had many light-bulbs for the book I am writing. The introduction is a must read, full of great examples and revealing what a great setting is made of. There's been something I've been doing since I discovered the Emotion Thesaurus by Angela Ackerman and Becca Puglisi. If you are an author you will probably relate. It is a point when you revise the first draft and make a certain note on the side of a page, again and again, "Re-write!" I used to hate or rather be utterly scared to go back to those bits. "How am I going to rewrite them?" was an ever returning questions as soon as I looked at the next "Re-write here!" bit. After discovering The Emotion Thesaurus, my notes became, "Consult The Emotion Thesaurus". This changed the whole rewriting for me completely. Now I am looking forward to find various ideas in The Emotion Thesaurus and see how that part of my book will change. There is this sense of discovery here. This book was amazing! I'm telling you. For a writer, especially one who maybe hasn't been to or experienced as many things, I need books like these to help my describe to my readers what I want them to hear, touch, and emotionally feel what I'm feeling. Rural settings Thesaurus has everything you need for every setting to the dusty attic to the mountain trees. Descriptions and senses written for you to experience and to help your audience experience what your experiencing in your mind. Rural Set This book was amazing! I'm telling you. For a writer, especially one who maybe hasn't been to or experienced as many things, I need books like these to help my describe to my readers what I want them to hear, touch, and emotionally feel what I'm feeling. Rural settings Thesaurus has everything you need for every setting to the dusty attic to the mountain trees. Descriptions and senses written for you to experience and to help your audience experience what your experiencing in your mind. Rural Settings is a marvelous, well put together, tool for any and all writers! When I heard authors Angela Ackerman & Becka Puglisi were coming out with two new Thesaurus's I quickly jumped out of my seat with a big "WOOHOO"! I never thought such books existed until one day I stumbled upon their Emotional Thesaurus which ultimately lead me to there website: Writers Helping Writers. Ladies and Gents, I seriously recommend not only checking out their website, but subscribe! This way you won't miss a thing; I know I don't! What a treasure! Highly recommend to any author. Each setting includes sights, sounds, smells, tastes, and textures and sensations. The authors include possible sources of conflict, people commonly found there, related settings, setting notes and tips as well as a setting description sample. So glad to have this! While I've been to many of these places, my settings can be enhanced by those special 'extras' these ladies have included. I was given a free copy in exchange for my honest review.